The USS INDIANA was one of the newest American battleships in 1898. She took part in the destruction of the Spanish Fleet at the Battle of Santiago off Cuba on July 3, one of the two major naval engagements of the war. 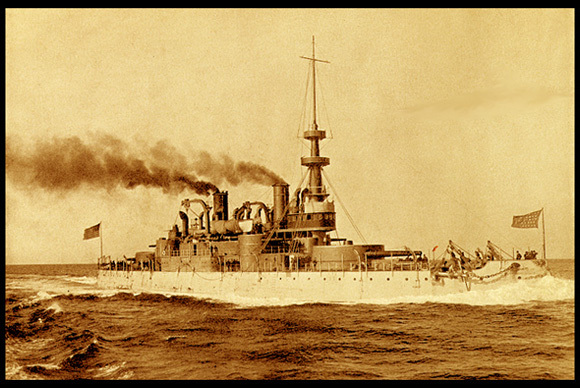 The USS INDIANA was one of the new fleet of battleships promoted a special board created in 1890 to recommend the manner in which to update the U.S. Navy so that it could defend adequately against the imperial world powers, as well as by the nations of South America (several of which had larger vessels than any in the U.S. Navy). The board realized the need for battleships with a long-range cruising capability. However, many members of the United States Congress were in favor of Isolationism, and opposed long-range battleships as they were obviously not intended strictly for coastal defense. To assuage fears of the Isolationists, the new class of vessels were called "Sea-going coast-line Battleships". The name, an all-covering oxymoron, was thought to be particularly brilliant and useful by Theodore Roosevelt after he became Assistant Secretary of the U.S. Navy. Three ships were authorized for construction, INDIANA BB-1, MASSACHUSETTS BB-2, and OREGON BB-3, making the INDIANA one of the United States' first true battleships. The three ships were authorized on June 30, 1890. At the outbreak of the Spanish-American War, USS INDIANA formed part of Admiral Sampson's Squadron which sailed to intercept Admiral Cervera's squadron, known to be en route to the Caribbean from Spain. INDIANA took part in bombardment of San Juan on May 12, 1898. Sampson then returned to Key West and resumed the blockade of Havana. When it was confirmed that Cervera was at Santiago de Cuba, Sampson's fleet joined Schley there on June 1 and the Admiral took command of the blockade. After the landing of U.S. Army units for an assault on Santiago, Cervera was ordered by Governor-General Blanco to break out of the harbor. His gallant dash out of Santiago on July 1898 led to the Battle of Santiago and the destruction of Cervera's entire command. INDIANA did not join in the initial chase westward because of her extreme eastern position on the blockade, but she was near the harbor entrance when the Spanish Torpedo Boat Destroyers PLUTON and FUROR emerged. In a short time both ships were destroyed by the guns of INDIANA and other ships. Meanwhile the other Spanish vessels were sunk or run ashore. INDIANA returned to her peacetime pattern of training exercises and fleet maneuvers after the war, and made practice cruises for midshipmen of the Naval Academy before decommissioning in December, 1903. She was recommissioned for training in January, 1906, and again decommissioned in May, 1914. The entry of the United States led INDIANA to being recommissioned as a gun training ship on May 24, 1917. She was decommissioned for the last time on January 31, 1919. INDIANA was sunk as bombing target on November 1, 1920, and the wreck was sold for scrapping in March, 1924. The greatest advantage of this class of battleships was the capacity of the coal bunkers, allowing the ships to cross the ocean without recoaling. They were the first American vessels that combined this capability with heavy armor and armament, a great advantage in times of war. The armor thickness and size of the main battery exceeded any that on any other ship in the US fleet, including the newer classes of battleships. One disadvantage of INDIANA and her sisters was a relativly low freeboard, which made the guns difficult to operate in heavy seas. 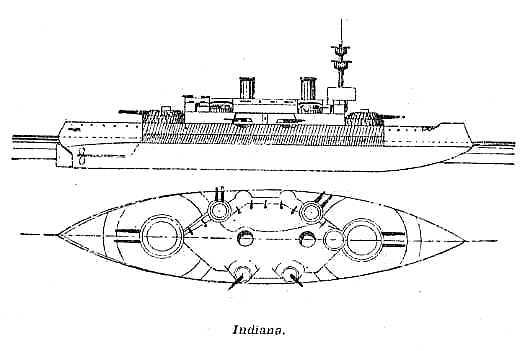 The main gun mountings were not centralized, so when the guns were aimed to the side, the ship would submerge farther on the side of the vessel to which the guns were aimed. This limited the elevation the guns could attain. Also, this resulted in the main armor belt being lower one side than designed and higher on the other when the guns were being aimed in this manner. The situation was eventaully rectified by adding counter-balances to the rear of the turrets. The mountings themselves continued to be a source of mechanical difficulty. The ship rolled excessively until retrofitted with bilge keels. As was typical for ships of this time period, coal bunkers were placed along the exterior hull of the ship to act as additional armor protecting the magazines. The proximity of the coal bunkers to the magazines created a danger that could result in the loss of the vessel. Spontaneous combustion of coal dust was not unusual, and a coal bunker fire could ignite an adjacent magazine. 32 officers and 441 enlisted men. Four double-ended and two single ended cylindrical boilers. Gardiner, Robert, Ed., Conway's History of the Ship: Steam, Steel & Shellfire - The Steam Warship 1815-1905. (London: Conway Maritime Press Ltd., 1992). Naval History Department, Navy Department, Dictionary of American Naval Fighting Ships. (Washington DC: Government Printing Office, 1959).